Testimonials for Together We Pass - What Students are Saying About Us! Testimonials for Together We Pass - What Students are Saying About Us! @TogetherWePass The team is so helpfull! Thank u guys and gals! Can see my #unisa studies will go great with u in my corner! 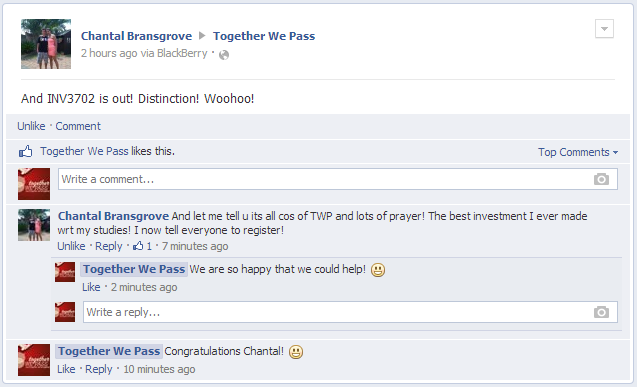 I was a bit sceptical but after reading the success tweets, I am now a believer that @TogetherWePass works. Can’t wait for 2014 to begin! IOP3703 and MNM3014 results are out. Distinctions in both!! thanks to @TogetherWePass. One more result to go and graduation here i come! @togetherwepass More than helpful! You know hOw much TWP and study grps have helped me come so far, passing 6 3rd levels 1st attempt! 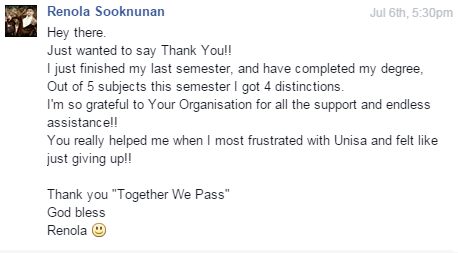 To all @unisa students I’d be lost right now without @TogetherWePass. I strongly suggest you visit their page ASAP. I just want to say thank you for your assistance with the study pack because they assisted a lot and have obtained a distinction in my module. Hope to join you in post grad studies. Re: Did you manage okay Mack? I sure did! 3 distinctions! Hi Sally and the whole TWP team. Thank you very much for all your assistance and hard work in helping us. I really appreciate all your efforts. You have really made it much easier for me to pass my subjects thus far. Not just to pass them, but to pass them well. I will definitly keep on supporting TWP throughout my whole study journey. I appreciate the notes you post for us. I always say to myself thanks to you and your wonderful team ( Together we pass ) every time I receive study information and my results. Today when I received my last results, thought saying is not enough. I spared sometime to write to you to show my appreciation for the assistance I got and still getting from your foundation. Studying and working full time is not easy at all. Its because of your help am progressing well and passing all my exams. Thank you a million times for the wonderful job you are doing and may Allah bless you, your family and your entire team —- Ameen. Unfortunately I didn’t register with any groups last semester. If that’s a requirement to win the competition then oh well, I guess I tried! Maybe I will register this semester, but I’ll need to check how finances look 😉 . Although I am not registered with any groups I love your Facebook and Twitter pages. Thanks for being a really great support system to us students. Sometimes it gets lonely being a part time student but you make us feel as though we belong to something much bigger! Together we pass really helped me out with assignments and preparing for the exam i managed to get all distinctions in my third year first semester, Thank you together we pass, you have me what i thought was impossible possible! RE: Have you received your UNISA exam results yet? Thank you for an excellent semester with TWP. I was registered for a CLA1502 group and received an astounding 88% for this subject. I will definitely join TWP again this semester. Thanks so much to TWP, for helping me with Economics, a subject I thought I would never pass. Now TWP has helped me to get a step closer to my graduation dream ! One more semester left! I will be buying all 5 module help from you guys for next semester as those that I purchased this semester are the only ones that I have managed to pass. Together we Pass is one of the best online study groups I have come across. Not only does it provide you with past papers and the opportunity for study groups, but the continuous emails motivating students and regular feedback is an add on which makes students feel more than just a number. There is a real interest in your development and the reward at the end of an exam is immeasurable. The satisfaction of seeing yet another pass is great. Thank you Together we Pass. I enjoyed the additional study material and multiple choice comparison tool. I also found great value in the newly introduced study packs – great value for money! My only criticism, which would be difficult to change, is that students don’t communicate within the study groups enough. This is a difficult mentality to change I think, when people register thinking that they are going to to be spoon fed and miraculously pass without doing any work. I passed FAC3702 with 66%, it was the third time I had written this module! I am so impressed! Waiting for my MAC3702 mark, so holding thumbs that will be a good pass too! I failed FAC3703, but can’t blame TWP, he site and materials were amazing…I dealt with a lot of work and personal stress during the exam period when I wrote FAC3703 and was just not in the right head space. Nevertheless, I will give it a good bash again in September. Thank you for all your hard work at TWP! You really made a difference! Hi Nazli, TWP helped me a lot last semester have passed MNG2601 & PMP both 2601 & 2602, still awaiting ECS1601 & PUB2606 but I know I’ve done well. for better or for worse commitment and dedication will be my driver for my peformance,and together through you being my committed partner in helping me pass my exams and i also do recommends your service. Re: Can we have two minutes of your time? Please note that I am no longer studying this year since I have completed my B.Com in Strategic Supply Management degree and graduated on 05 June 2015 from UNISA. I would like to take this time to thank you for all the support and encouragement. I will always recommend you to whoever might need support in his/her studies. Re: Hey how was the paper? Not too bad, wish I had more time though – age old complaint in accounting papers I suppose. Finished about 76% of the paper and I think I had good content and calculations. My year mark is 96% so at least I have about 18 marks there to help me out for the final mark. Thank you for all the support! TWP really made the difference for me! Two more papers to go! Thank you so much for all the help in completing my degree. I wouldn’t have been able to do this without Together We Pass. The study groups was a HUGE help. Not only would I have been seriously lost without them, but they also enabled me to achieve marks way beyond my wildest expectations. 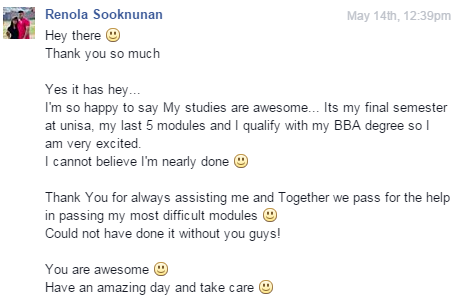 I am so grateful that I found out about you and will definitely keep recommending you to other students. Hectic environment of delivering services at the same time. Yes, I hope to see your assistance in CTA Level. I have to commend you on your personal service and the ease of access on the website! This is fantastic! I’ll be sure to pass. Maybe get a few distinctions with the material you’re providing. I really think you should put yourself out there more. I’m sure there’s a lot of students unaware of this great initiative. Tabitha, you are so awesome, thank you for taking the success of your subscribers onto yourself and doing so much to make sure we are adequately equipped to pass this exam. I would like to thank you from the bottom of my heart for all the effort that you have made.Iv qualified with my degree and it wouldn’t have been possible without your assistance.When I started off in 2010 I registered with you,once again thank you sooo much for your support and encouragement. Hey TWP I almost forgot to thank you. I discovered TWP during my final two semesters of which both semesters were very tough. I believe I owe you a big thumbs up for all the additional resources which you have provided me with. I am an average student and achieved 75% for AUE303 and 78% for AUE304 during my final semester. It was a really nice way to end off my degree. Again it was a good exam period. Thank you very much for all the support. I indeed can see the end of the road now. It is not easy trying to do this alone especially considering that I am in Zimbabwe but you indeed have made the journey exciting and much easier. I have had a very fruitful academic year and its all thanks to you. To be honest I love the way you operate in a way that’s my preferred method of study. So don’t stop now, you’re doing a GREAT job. I was sceptical at first but you guys do a great job supporting students that are loners. I like the facebook updates. I am done with exams and now anxiously waiting for results! Hoping that they will be released soon. I also want to take this opportunity to thank you guys for all your help and professionalism! It helps make studying and exams less daunting. I have been a part of your study groups and found them very helpful. As a way of saying thank you (again) I have decided (and posted about it a few minutes ago) to remind people to join your study groups. I have already done this previously quite often, but decided to reiterate it to a Discussion forum where students are in need of exam preparation help. I hope that they will respond to directly and benefit. Good News! I have passed both my modules, IOP2601 with distinction. I’m so excited. I managed to achieve this through the intervention on TogetherWePass in my studies. I would like to take this opportunity to thank you and your team for all the hard work and positive contribution in my career. I have recommended a friend and she passed with two distinctions as well. Keep doing the good work, now I’m looking forward to register other three modules. Thanks once more and have a blessed day. Please note that I have successfully completed my degree. I passed my concession exam. I have been promoting together we pass, so my friends will be joining once they register. I just want to say thank you for all the information that you have supplied and for the invite to dropbox.This information is really going to help me. Once again ,thank you,I really do appreciate it. I greatly appreciate you getting back to me… I’m currently in Brisbane Australia… Last semester I registered with you a week before my exam and I got a pass of 72% and 1 distinction and a pass of 60%. You have been a great help. I have made use of your study group for the last 3 and half years and want to thank you very much. I have passed all 6 subjects last semester and will be graduating soon. I think it is in March. Does your group also cater for Bachelor of Commerce in Law? I am please to inform you that I have finished my course . Just wanted to thank you for the work you are doing! I needed all the help I could get with ACN3084 and ACN3073, and I’m glad to say thanks to you and the resources your groups provided I passed these subjects the first time around and achieved a distinction mark … for ACN3084 in the Oct/Nov exams of 2012! I never would’ve made it without you guys, you have truly kept your word because together we really do pass! I would like to thank u and your team for all assistance during this year, during my first semester I was part of the top five achievers obtaining 3 distinctions, . This wouldn’t have been possible without all guidance and help from u and the team. This semester I’m proud to say that I obtained 4 distinctions and 1 B pass. All my subjects were 3rd level modules. The resources given to me assisted so much and I’m so truly grateful for this. I recommend all students to join together we pass. U guys are so awesome. Hope you are all getting a little holiday. Thanks for all the help! I got a distinction for FIN2601 so I’m super impressed! Waiting for one more, but a little group assistance like this programme sure helps. I used TWP last year and it helped me with MNB1501. I am doing a BCommSci and really looking fwd to doing courses that u provide the support for so that I can ensure another distinction. Thank you for the wonderful help and support!!!! Received really good marks in my assignments!! Thanks a lot for the last term. If it wasn’t for you guys I would have failed. The resources, the group and Together We Pass Team have helped me a lot! Thanks for everything can’t wait for this term with you guys!! I just wanted to thank you and your team for all your guidence during this semester. With your help I was able to do so well and pass all my courses, 3 with distinctions. Please see below my results. HRM2605 76% Passed with Distinction. MNC202M 77% Passed with Distinction. MNG301A 100% Passed with Distinction. As promised – below are my results. I got 85% for both assign 01 and 02. My exam mark was 84% Thank you so much for all your help!!! I can’t believe I got a distinction for accounts!!!!! Words cannot express how much you have done for me this year.Since joining your study groups at the beginning of the year, I wrote 8 modules and passed all 8. Thank you so much. I am looking forward to working with you again in 2012. Just wanted to thank you for all the help with FAC1601, thanx to you and your notes i passed this subject in one sitting. Looking forward to working with you and the groups in my Honours programme. God Bless u and have a lovely Christmas. I passed my last exam FAC3704 and I’m now a BCompt UNISA holder thanks to you. I wouldnt have made it without a bit of a push from you and the study material. I passed my exam with flying colours thanks to you and your notes and interaction throughout the semester. I got 70% overall MNH202 which is quite good. Thanks for all your help and I will definitely be registering with you next semester. You are a STAR!!! True Tabby and thanks for your support. I trust that with more effort I’ll make it. I’ll network with other students and keep the groups that we have with you because I am coming a long way with your organised groups and have helped me a lot.Stay blessed! 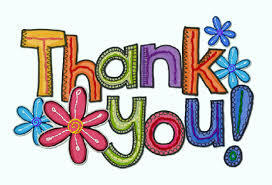 Just want to say thank you for your help last semester – I struggled to pass the same module (FAC3704) 3 times. Luckily, on the 4th try I enrolled in your group and even though I only did slightly better in the exam, the fact that I had a good year mark (thanks to your group working through the assignments together) helped me get a pass I am now the proud owner of a BCom degree – will recommend your groups to anyone that I can! It’s true it was a very short term and I hope that it wasn’t that easy but being a hard work, focus, discipline and aiming to achieve goals is something that no one will ever regret it. I thank you for all the support you gave me all through my studies. If you don’t hear from me soon, have a lovely Christmas and New Year. Cheers! Excellent tabs thanks for the speedy reply I will email you as soon as I receive my results! From there will make my selection for next semester Have a stunning weekend My first time I registerd with you and trust me your resources helped me so much! Please count me in for next semester, provisionally for four modules. I also want to thank you for the materials you send me for MNG2016 and MNO202. Though I joint you late last month, it helped me a lot with my exams and I am hoping for a pass in both modules. I have never been so confident after writing exams. Thank you very much! I managed to pass my ECS102 and IOP101. May God bless you as you’ve been a blessing to some of us. My life is so hectic, I work , run a business and study… and really joining the study groups allowed me some time to be able to manage my life. I completing very soon as I have 4 modules to go, I wish I knew about his when I started. Thanks you so much, for all the help last semester. I passed all four subjects but I definitely think it was mainly due to your study groups and all the extra notes. I don’t think its possible to pass without extra help while you’re working at the same time. The subjects that I’m doing this semester are ACN102, MNB102, ECS101 and DSC1630. Is there any possibility in doing something similar to last semester? Paying half now and the other half a little bit later in the year? I want to give a BIG THANK you and every one else who contributed and was involved in the study group with regards to ECS101. It was such a great help to have all the notes and old exam papers that was provided – not to mention the study group sessions for the assignments. This was the second time that I wrote ECS as I failed it before. I’m very thrilled to say that with all this assistance – I passed. To everyone else out there, it is worth the little bit of money to ensure a pass. Once again, it was worth every penny and would do it again when need be. Thank you so much! Just want to say thank you for doing this! I study from overseas, and the service you deliver is BRILLIANT!! Especially old exam papers!! I used your service for ACN101, and your help, plus some hard work resulted in me getting 91%! Definitely signing up for this Semester! Just wanted to thank you for all the help with ECS102, thanx to you and your notes i finally passed this subject. looking forward to working with you and the groups next semester. Did really well with ACN101 = 76% Thanks for all the help Look forward to ACN102 this semester. Hope you are keeping well. I would like to take this opportunity to express my thanks to the difference your study material made in my life last semester. I wrote ECS102 and I just made use of the study pack of past exam questions and answers you supplied to us. It was such lovely feeling writing the exams because I knew most of the answers. Naturally I passed my exam and were very pleased to see that I have obtained 63 %. Keep up the good work it really adds value. The following two emails were to a student worried about joining the groups as she was worried about whether I was genuine. Hope this helps you out – please come back to me if you have any queries! I, Antigone Georgiou have been part of Tabby’s study group since the beginning of the year, three months now. She is very helpful and has emailed all her study group students materials and whenever assignments comes up she will also help and compare with the other students that have emailed their answers to her. Phawe, she is not one of those bogus people, I trust her completely. She is there to help you past whatever subjects you have registered and most of all she is there to help you past the subject. I have load of material from Tabby for the subjects I have registered for.